A long, less technical route kind of route, rideable throughout the year. It is very interesting from a landscape and cultural perspective. 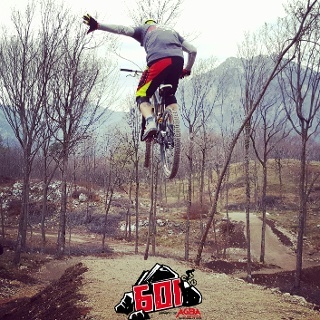 The Garda Sarca loop was the first route for mountain bikers and hikers created by the Garda Trentino tourism company. Opened in 2011, it precedes the new provincial legislation which regulates the paths. This is the reason why the 731 route signs differ from the newer route signage in the area. The tour involves a good part of the Valle del Basso Sarca (the low Sarca valley) and for the distance of almost 60 km, the ascents and descents vary considerably. The distance and altitude difference make this route undoubtedly demanding. From a technical point of view, apart from a few short sections with rough and sometimes loose terrain, there are no particular difficulties. Both uphill and downhill, a gradient of 20% is reached, mostly on asphalt and in forested areas. If it has rained the terrain may be slippery, especially on the sections of cement. 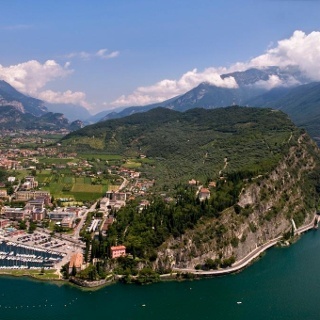 In a single itinerary, you can enjoy the great variety of landscapes and trails that Garda Trentino has to offer! From the shores of the famous Lake Garda to the hidden gems of the surrounding areas. The starting point is from Parco delle Busatte, not far from the centre of Torbole, where there is also a free car park. The route, passing all the popular nearby tourist areas can actually be picked up at any of these points. Starting from the park, you immediately, well guided by the signs, descend towards the centre of Torbole. Once in Piazza Goethe, keep right a few dozen meters on the Strada Statale Lungolago - main road along the lake. 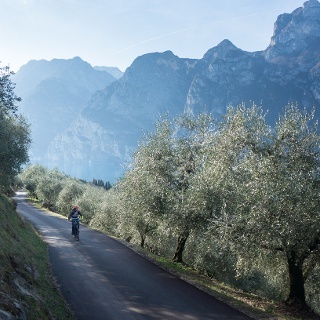 Turn left onto Via Benaco, and from here, follow the cycle-pedestrian path that runs along the lake towards Riva del Garda. Just before reaching the centre of the town there is the mouth of a stream, follow it round to the right, heading north toward Varone. Cross the main road - Viale Rovereto and continue to follow the cycle path / stream up to Varone. Here, at the traffic controlled crossroads turn left, then take an immediate right - you should go past an old church on your left. The next turn will be near to a fountain, where begins a beautiful climb amongst the olive trees towards Deva. Eventually you will meet a minor provincial road at a hairpin bend, continuing to climb, cross the hairpin and then turn immediately right. After a short stretch of gravel track, you will meet and continue on to the main road - SP37 where you climb for 1km. Keep right and take the short cement ramp up on to Via Molini, which leads to Tenno Castle, on the opposite side of the narrow valley. At the red stop road sign, close to the castle ruins - keep right and after a few dozen meters, cross the main road to take a slightly uphill road on the left. Follow the signs along the gravel road Strada del Pil - climbing up to Alto (High) Garda. Once in Volta di No, you will find a paved road, and following the signs continue on to descend into Varignano. Here there is another short stretch of gravel, then a series of steep cement bends between the olive trees. At the end of the descent, near a village, turn left to Padaro. After about 700 meters of climbing follow the signs, turning right through the gravel roads of the olive groves towards Arco. Once in central Arco, at the foot of the castle, continue to climb, keeping to the left, in the direction of Laghel. The gradient gradually increases until you reach the small church of Santa Maria di Laghel. Continue straight here, for about 1.5 km, then turn right, taking you down to the bottom of the valley. Along this stretch of descent, there are steep, alternating sections of concrete and gravel. At the junction near Maso Lizzone, turn left, continuing to climb the valley through the beautiful countryside. Nearing the centre of Dro, you will again find smooth asphalt roads. Following the signs - your next destination is an easy forest road, at the foot of Monte Brento, in the direction of Pietramurata. On the last part of this segment, the short uphill section is rather bumpy and with a slightly exposed section at the summit. Once near a motocross park, you will find a small asphalt road that then joins the SS45bis main road, follow this heading north. It is advisable to remain on the pavement that runs alongside it however. After about 300 meters, near to the centre of the village, take the secondary road on your right. You are in Pietramurata! Following the road round to the right you will continue through the town, past the church and across the Sarca river. Here you must turn right as the route starts to loop back south, crossing the countryside for the cycle path to Dro. Once in the Monte Taglio area, the directions of the route lead off the cycle path, following instead the path to the left. The initial stretch is full of ups and downs through the undergrowth, with sections of quite pronounced rocks, but stable rocks. With Lago di Cavedine in your sights, the descent to water level begins. Pass an old electric plant building and follow the gravel road until you meet the main road to the lake. Keep left, then immediately turn right where you will resume climbing through the Trebi area. Cycling through the vineyards makes for a splendid experience, especially in spring and autumn. From here you can admire Cavedine lake and the mountains Brento and Casale. Paganella is on the left, in the background, with the slopes of Monte Bondone on the right. After some more climbing on asphalt, you will reach the pylons of the electric line. Here you must turn right, ready to face the most challenging descent of the whole route. Once you get to the main road for Drena, cross it and continue your descent using the path on the other side. The gradients are not too steep here, but the terrain is rather unstable. Meeting the main road again, follow it in a southerly direction for just over 600 meters, then turn left, continuing off road, in the direction of Arco. When you reach the main road junction at Moletta, continue south, remaining for a short time on the pavement on the left side of the road. At the next turning, keep left, continuing to follow the directions of the route. Using the safer internal roads, you will go through the small towns of Massone and Bolognano. Once in Vignole, you will meet a main road at a traffic light. Cross it, and take the secondary road on the other side. At the fork, keep right and follow the signs which will guide you through the area of Prato Saiano - to Nago, for the last climb of the day. Pay particular attention when crossing the main road at the Sesto Grado bar, it’s on a hairpin bend! After completing the last cement section, near to a busy roundabout, continue on your right to Via Scipio Sighele, heading toward the characteristic centre of Nago. At the end of the town, there is a slight climb in the direction of Monte Baldo... Nearly there! One last descent on concrete, and you will re-emerge on to Lake Garda where you can quickly reach the start point in Torbole. Tolle Tour! Genau die richtige Länge für eine Tagestour. Bequeme Anstiege, technische einfache Abfahrten und tolle Landschaft abseits des Verkehrs. 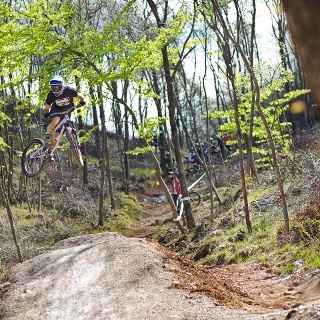 Als Cross Country MTB Tour sehr empfehlenswert.